Unexpected Ways The Government Shutdown Might Affect You In the second week of the federal shutdown, consumers might notice fallout in unexpected places, from poop in national parks to closed museums. 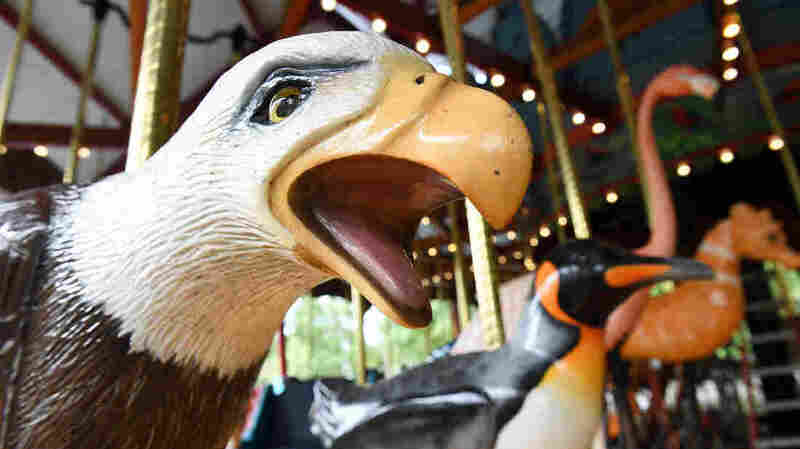 As of Wednesday, you won't be able to ride this bald eagle at the carousel at the Smithsonian National Zoo in Washington, D.C. The zoo and Smithsonian museums closed to the public because of the partial government shutdown. As the federal government enters the second full week of its partial shutdown, federal workers aren't the only ones affected. A new congressional session starts on Thursday, with Democrats as the majority in the House, but there's no indication that the shutdown will end before then. "It's really disappointing for our public because we know so many people come to Washington with plans to visit the Smithsonian museums, which are free," Smithsonian spokesperson Linda St. Thomas told WAMU's Sasha-Ann Simons. "And they really plan on that being a part of their visit to the city." Leave no trace: About two weeks into the shutdown, garbage and human waste are piling up in Yosemite National Park, The Los Angeles Times reported. The park has stayed open since the shutdown began, making do with fewer resources, like restrooms. Without access to restrooms, some park visitors are relieving themselves outside, but they aren't following the park services' recommendation to pack and carry out or bury their solid waste. As a result, some areas of the park, including "all snow play areas," have been closed. "It's a free-for-all," Dakota Snider, who lives in Yosemite Valley, told The Associated Press on Monday. "It's so heartbreaking. There is more trash and human waste and disregard for the rules than I've seen in my four years living here." Yosemite isn't the only park affected by the shutdown; trash and toilets are a problem in Joshua Tree and Pinnacles National Park in California, and at Rocky Mountain National Park in Colorado. Other parks like Arches and Canyonlands in Utah and Yellowstone National Park have announced full or partial closures because of personnel shortages. And beware of checking nps.org for updates; the website won't be updated during the shutdown. Loans lost: Several government agencies that give out loans have had their purse strings tied by the federal shutdown. NPR's Shannon Van Sant reported last month that new housing development grants and housing quality inspections may be delayed. So could loans for new homebuyers. The Small Business Administration also won't be able to process loan applications that startups and small-business owners use to get funding, USA Today reports. The Department of Agriculture also announced last week that it won't be issuing any new rural development loans, which are designed to aid home, business and utility development in rural areas. In the capital, some restaurants are offering deals on food to anyone with a government employee ID. Celebrity chef José Andres promised a free sandwich for furloughed federal workers at any of his D.C. restaurants, NPR's Bobby Allyn reported. Capitol Lounge even released a menu of shutdown-themed cocktails, including a vodka-based "Nothing Really Mattis" and a tequila-infused "Border Wall Banger."